It was the worst day in X-Men history. Now it's the day after. 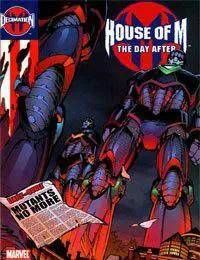 The House of M is over, but the effects will be felt for the rest of their lives. How do the X-Men pick up the pieces in a world that has completely changed? This special one-shot is the world's first real glimpse into the entire Marvel Universe, post-House of M. It also gives a special preview of the titles that come out of that event, such as New Excalibur, X-Factor, Generation M, and a few we can't name here! We said the world was changed. You've been warned!